The stocks bull market trend drove to a series of new all time highs during 2014, ending up for the sixth year in a row at Dow 17,823. So another year where the always imminent market crash and new bear market reverse gear courtesy of a string of crisis events from the euro-zone depression to the End of Fed QE fatal accidents just never materialised. 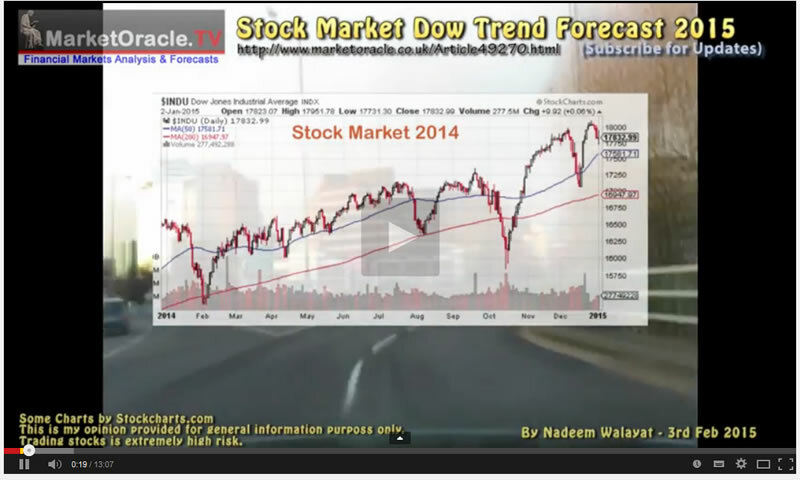 In this video I conclude in detailed trend forecast for stock market for 2015. "Greater the deviation from the stock market high then the greater the buying opportunity presented." Subscribe to our youtube channel for regular updates, and my free newsletter to get in-depth analysis in your email in box. That is what individual freedom means, choice.